Getting Back on Track, launched on Tuesday by the Road Safety Foundation (RSF), identifies 40 persistently high-risk routes, which it says are the highest priority routes for systematic and proactive road safety treatment. Dr Suzy Charman, author of the report and RSF executive director, said the recent results from the Safer Roads Fund show that road rehabilitation packages can compete with major transport projects. The £100m investment made through the Safer Roads Fund is projected to prevent 1,450 fatal and serious injuries. As Transport Network has reported, the Fund was originally worth £175m but ministers have declined to state what the remaining £75m will be spent on. Dr Charman pointed out that if road safety treatments to the value of £75m were carried out on the 40 high-risk routes, 1,100 fatal and serious injuries could be prevented during the next two decades. The RSF pointed out that the highest annual number of road deaths since 2011 was recorded on Great Britain’s roads in 2017, at a societal cost of £35bn. Dr Charman said: ‘After decades of trauma reduction, we have reached a plateau. In effect, a decade has been lost. 2,549 people have not returned to their families so far because we are not on track to halve our road deaths this decade. It is time to break that plateau and get back on track. The report highlights the risk of death and serious injury on motorways and A roads outside urban cores, which represent around 10% of the road network but account for more than half of all Britain’s road deaths. According to the report, the highest risk road is the A254 in Kent, and the most significantly improved road in the survey is a stretch of the A161 in Yorkshire. 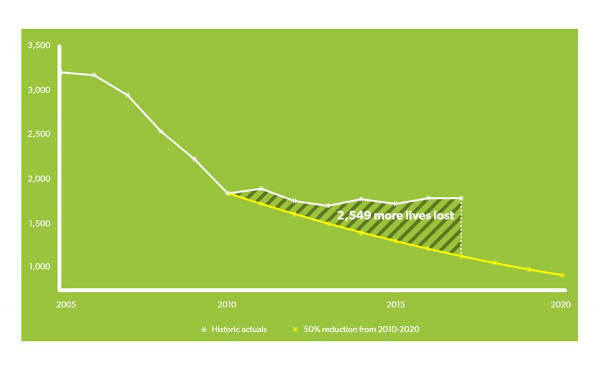 Overall, the 10 most improved roads realised a 69% reduction in deaths and serious injuries. The annual value of preventing these crashes was £12m in 2015 values.